Recently I was in Washington, D.C. on business. I left my hotel one morning in a bit of a hurry. Instead of eating breakfast in a restaurant, I grabbed it to go and headed towards my office just a few blocks away. I started praying as I walked. 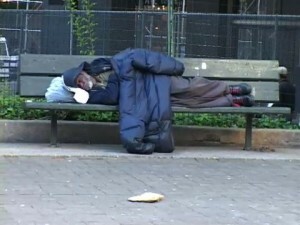 For those who haven’t been to D.C., there are homeless people on every block. I got excited at the idea of blessing someone with some food (even as I knew I would not eat any breakfast myself.) Unlike most of the homeless, I knew I would eat at lunch, so this wasn’t really much of a sacrifice the more I thought about it. So I walked along towards the office looking around for someone. For three blocks I saw no one in need, which was very strange. As I circled the block that my office is located on, I wondered if I would have any opportunity to give away my breakfast and started to feel disappointed. Then, just before I reached the front entrance, I saw him. A middle-aged, African-American man sitting on the steps of the Smithsonian Museum with a backpack, shaggy facial hair, and a winter cap. His legs were folded over each other in what could have been a yoga pose under different circumstances. He was across the street from me and I had to circle around some construction to make it over to the other side. The more steps I took towards him, the more nervous I became. I was scared. Not that he would hurt me or anything, but just about what would happen. What would he say? What would I say to him? I approached him and saw he had his tongue sticking out and was looking up at the sky. Even as doubts swirled around in my head, I willed myself to keep walking and prayed to God to guide me with whatever happened. “Excuse me,” I said. “I was wondering if you would like some breakfast?” I held up the paper bag. “Oh, sure I would,” he responds. “Okay. I have eggs, sausage, and then you can choose. Would you like orange juice or water?” I ask. He says yes. I hand over everything. Then I ask him his name. He nods his head and starts digging into the food. “I hope you have a good day, Albert,” I say. I start to walk away. (I had a meeting to get to and he was occupied with the food.) Then he mumbles something. I ask him to repeat. I do have spare change. I actually have cash for tips, cabs, etc. I pull out only a couple of dollars because I don’t want to think too long about it and felt a little weird debating with myself the proper amount to give with him sitting right in front of me. As I walk back to the office I’m regretting that I didn’t talk to him longer. I’m regretting that I didn’t say “God bless you.” I wondered how many people walked by him every day. I wondered if he would use the couple of bucks to buy alcohol or drugs. I wondered if he would be there when I got out of work. I wondered if anyone saw me who I knew. I didn’t want anyone to see, but I also wanted people to know his name was Albert. I wanted to know more of his story. I wanted to sit down on the steps and listen to him, but I had a job to get to. So, I prayed for Albert as I rode the elevator up to my floor and tried to make sense of how my life could be so very different from his. I’m glad I took the risk of bringing him my breakfast, but I also feel like I need to practice things like this a bit more and maybe I won’t be so nervous about it. Maybe I’ll sit down and listen to his story. Oh, and it turns out there was breakfast provided at my meeting when I arrived. Go figure. Well played, God. Well played. ***This is the first article in my series ‘Homeless in America’. I hope these stories will open hearts and minds to these people. I hope others will want to learn their names.